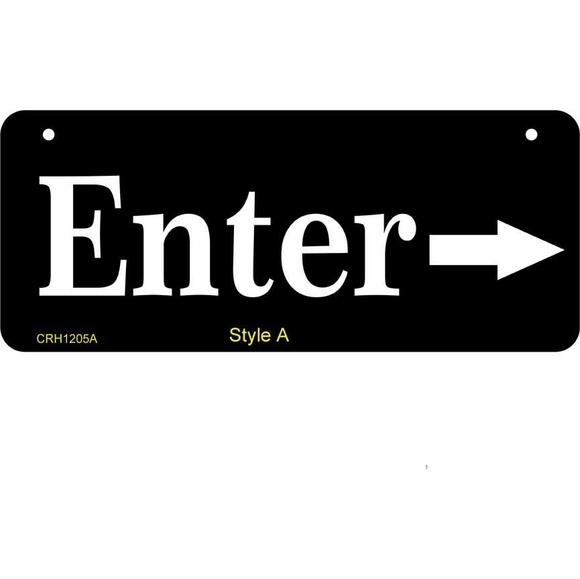 Double Sided Hanging Sign - - custom made hanging sign with your address, name, or message. For homes, professional offices, and businesses. Made in USA. This 12"W x 5"H x 1/8", double sided hanging sign accommodates various personalization requirements. Signs ship with two 1/4" mounting holes on 10" centers. Ready to hang from your own post or bracket. Click top link in Related Products for a suitable bracket. The rectangle with radius corners is large enough to get your message out without being intrusive. Made from sturdy and UV-stabilized 1/8" laminated acrylic. Three styles available with the same personalization on both sides. Style A one line without arrow holds up to eight (8) 2.5" characters. Style A one line with arrow (as shown above) holds up to five (5) 2.5" characters. Style B two lines. Each line holds up to twelve (12) 1.5" characters. If you are ordering Style A, please leave the Line 2 input box empty. Not big enough? Not small enough? Need more lines? Need more character spaces? Need vertical orientation? We will supply your custom sign any way you require. Please contact customer service with your specifications for a quotation (customerservice@comforthouse.com).